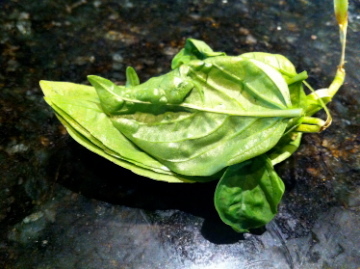 Start by making your pesto. You will want those flavors to marry in the fridge for a while. See recipe below. 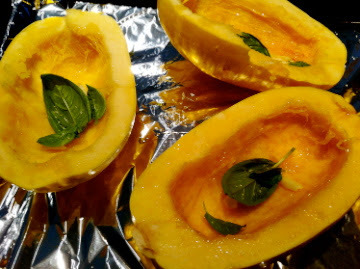 Next, roast your spaghetti squash. While that is in the oven, mix together the spices in a small bowl. Preheat your grill. 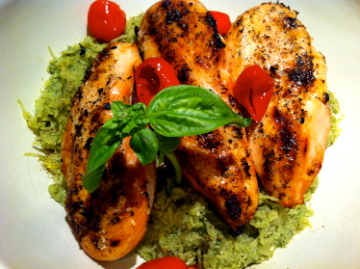 Rub the spice mixture all over your chicken breasts. Grill over indirect heat until cooked through, about 8 minutes on each side. Let the chicken rest, then slice into strips and squeeze the lemon juice on top. Mix the pesto into the spaghetti squash. Pile the basil leaves in a stack. Roll the stack tightly then slice into little ribbons. Add to the pesto pasta. Top the whole thing with the chicken slices and peppadews. Sprinkle with red pepper flakes to taste! 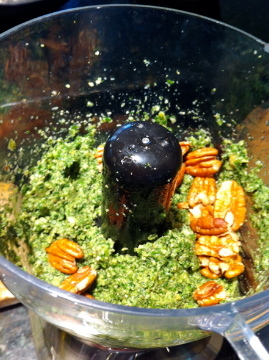 Add kale, broccoli, nuts, lemon juice, worchestershire, garlic, red pepper flakes and salt and pepper to your food processor and give it a whirl. With the blade running, drizzle in the olive oil and puree until smooth. Thanks for the unique recipe! Actually, it seems pretty easy to make, and the best thing is good explained how to make. 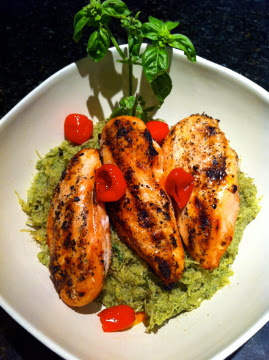 Paleo Pesto looks wonderful on photo! I definitely encourage you to try this one! Thanks for the support! Let me know how you like it! What temp should the oven be set and how long should we have the spaghetti squash in the oven. I know you mentioning roasting it but I'm not familiar with what temp that would be considered. Preheat oven to 375º. 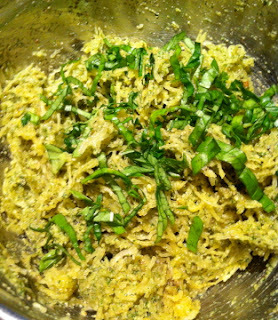 Cut spaghetti squash into 4 equal pieces. Scoop out the seeds with a spoon and drizzle with olive oil, butter or coconut oil. Spread on a foil lined pan and bake for 40-50 minutes. Let cool and scrape out the flesh. It is the PERFECT pasta substitute!